Not to be confused with Ukrainian People's Republic of Soviets or West Ukrainian People's Republic. The Ukrainian People's Republic, or Ukrainian National Republic[a] (abbreviated to УНР, UNR), a predecessor of modern Ukraine, was declared on 10 June 1917 following the February Revolution in Russia. It initially formed part of the Russian Republic, but proclaimed its independence on 25 January 1918. During its short existence the republic went through several political transformations - from the socialist-leaning republic headed by the Central Council with its general secretariat to the national republic led by the Directorate and by Symon Petliura. Between April and December 1918 the Ukrainian People's Republic did not function, having been overthrown by the Ukrainian State of Pavlo Skoropadsky. [need quotation to verify] From late 1919 the UNR operated as an ally of the Second Polish Republic, but by then the state de facto no longer existed in Ukraine. The 18 March 1921 Treaty of Riga between the Second Polish Republic, Soviet Russia (acting also on behalf of Soviet Belarus) and of Soviet Ukraine sealed the fate of the Ukrainian People's Republic. After the Bolshevik Revolution of November 1917, many governments formed in Ukraine – most notably the Ukrainian People's Republic (based in Kiev) and the Ukrainian People's Republic of Soviets (1917–1918, based in Kharkiv) and its Soviet successors. These two entities, plus the White Movement, Poland, Green armies and the Revolutionary Insurrectionary Army of Ukraine, fought constantly with each other, which resulted in many casualties among Ukrainians fighting in a Ukrainian civil war (1917-1921) as part of the wider Russian Civil War of 1917-1922. 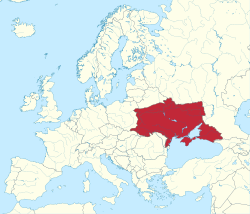 The Soviet Union would (after the 1921 Treaty of Riga) extend control over what would ultimately become the Ukrainian Soviet Socialist Republic and (in 1922) a founding member of the Soviet Union. 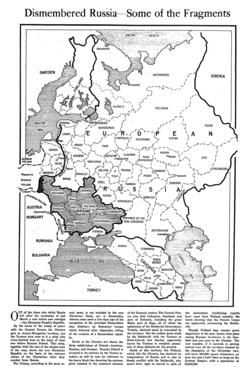 February 1918 article from The New York Times showing a map of the Russian Imperial territories claimed by Ukraine People's Republic at the time, before the annexation of the Austro-Hungarian lands of the West Ukrainian People's Republic. On 10 June 1917, the Ukrainian Central Council declared its autonomy as part of the Russian Republic by its First Universal at the All-Ukrainian Military Congress. The highest governing body of the Ukrainian People's Republic became the General Secretariat headed by Volodymyr Vynnychenko. The Prime Minister of Russia Alexander Kerensky recognized the Secretariat, appointing it as the representative governing body of the Russian Provisional Government and limiting its powers to five governorates: Volyn, Kiev, Podolie, Chernigov, and Poltova. At first Vynnychenko protested and left his post as Secretariat leader, but eventually returned to reassemble the Secretariat after the Tsentralna Rada accepted the Kerensky Instruktsiya and issued the Second Universal. After the October Revolution the Kievan faction of the Bolshevik Party instigated the uprising in Kiev on November 8, 1917 in order to establish Soviet power in the city. Kiev Military District forces attempted to stop it, but after the Tsentralna Rada threw its support behind the Bolsheviks, the Russian forces were eliminated from Kiev. After expelling the government forces, the Rada announced a wider autonomy for the Ukrainian Republic, still maintaining ties to Russia, on November 22, 1917. The territory of the republic was proclaimed by the Third Universal November 20, 1917 (November 7 by Old Style) of the Tsentralna Rada encompassing the governorates: Volyn, Kiev, Podolie, Chernigov, Poltava, Kharkov, Yekaterinoslav, Kerson, Taurida (not including Crimea). It also stated that the people of the governorates: Voronezh, Kholm, and Kursk were welcome to join the republic through a referendum. Further the Tsentralna Rada in its Universal stated that because there was no Government in the Russian Republic after the October Revolution it proclaimed itself the Supreme governing body of the territory of Ukraine until order in the Russian republic could be restored. The Central Rada called all revolutionary activities such as the October Revolution a civil war and expressed its hopes for the resolution of the chaos. After a brief truce, the Bolsheviks realized that the Rada had no intention of supporting the Bolshevik Revolution. They re-organized into an All-Ukrainian Council of Soviets in December 1917 in an attempt to seize power. When that failed due to the Bolsheviks' relative lack of popularity in Kiev, they moved to Kharkiv. The Bolsheviks of Ukraine declared the government of the Ukrainian People's Republic outlawed and proclaimed the Ukrainian People's Republic of Soviets with capital in Kiev, claiming that the government of the People's Secretaries of Ukraine was the only government in the country. The Bolshevik Red Army entered Ukraine from the Russian SFSR in support of the local Soviet government. As the relationships between members within the Tsentralna Rada soured, a series of regional Soviet republics on the territory of Ukraine proclaimed their independence and allegiance to the Petrograd sovnarkom (Odessa Soviet Republic (southern Ukraine), Donetsk-Krivoi Rog Soviet Republic (eastern Ukraine)). The Donetsk-Kryvoi Rog Republic was created by a direct decree of Lenin as part of the Russian SFSR with its capital in Kharkiv. That decree was successfully implemented by Fyodor Sergeyev who became the chairman of the local government as well as joining the Soviet government of Ukraine, simultaneously. Unlike Fyodor Sergeyev's Republic, the Odessa Republic was not recognized by any other Bolshevik governments and on its own initiative had entered a military conflict with Romania for control over the Moldavian Democratic Republic, whose territory it was contesting. 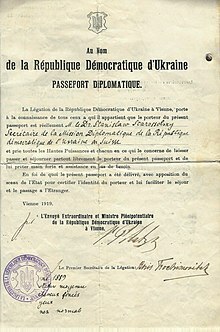 1919 Ukraine People's Republic Diplomatic passport issued for serving in Switzerland. UPR postcard with national flag and anthem. November–December 1917. In April 1918 troops loyal to the Ukrainian People's Republic take control of several cities in the Donbass region. Due to the aggression from Soviet Russia, on January 25, 1918, the Tsentralna Rada issued its Fourth Universal (dated January 22, 1918), breaking ties with Bolshevik Russia and proclaiming a sovereign Ukrainian state. Less than a month later, on February 9, 1918, the Red Army seized Kiev. Besieged by the Bolsheviks and having lost much territory, the Rada was forced to seek foreign aid, and signed the Treaty of Brest-Litovsk on February 9, 1918 to obtain military help from the German and Austro-Hungarian Empires. Germany helped the Ukrainian Army force the Bolsheviks out of Ukraine. 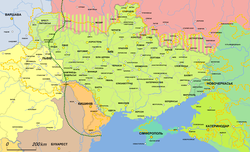 On February 20, 1918 the council of the Kuban People's Republic accepted the resolution for a federal union of Kuban with Ukraine as Bolshevik forces pushed towards Yekaterinodar. It was agreed to forward the resolution for ratification to the Ukrainian government. After the treaty of Brest-Litovsk, Ukraine became a virtual protectorate of the German Empire which at that time seemed more favorable than being overrun by the Soviet forces that were spreading havoc in the country. Germany was anxious about losing the war and was trying to speed up the process of food extraction from Ukraine, so it decided to install its own administration in the person of Generalfeldmarschall von Eichhorn who replaced the Colonel General Alexander von Linsingen. On April 6 the commander of the Army group Kijew issued an order in which he explained his intentions to execute the conditions of the treaty. That, of course, conflicted with the laws of the Ukrainian government, which annulled his order. By April 1918 the German-Austrian Operation Faustschlag offensive had completely removed the Bolsheviks from Ukraine. The German/Austro-Hungarian victories in Ukraine were due to the apathy of the locals and the inferior fighting skills of Bolsheviks troops compared to their Austro-Hungarian and German counterparts. The Germans arrested and disbanded the Tsentralna Rada on April 29, 1918 to stop the social reforms that were taking place and retarding the process of food supply transfer to Germany and Austria-Hungary. The German authorities also arrested the Ukrainian Prime Minister, Vsevolod Holubovych, on terrorist charges, and thus disbanded the Council of People's Ministers. Prior to this, the Rada had approved the Constitution of the Ukrainian People's Republic. Concurrently with all these events and a few days prior to the change of powers in the country on April 24, 1918 the government of Belarus confirmed the Belarusian Chamber of Commerce in Kiev headed by Mitrofan Dovnar-Zapolsky on the initiative of the Belarusian secretary of finance Pyotr Krechevsky. After the coup, the Rada was replaced by the conservative government of Hetman Pavlo Skoropadsky, the Hetmanate, and the Ukrainian People's Republic by a "Ukrainian State" (Ukrayinska derzhava). Skoropadsky, a former officer of the Russian Empire, established a regime favoring large landowners and concentrating power at the top. The government had little support from Ukrainian activists, but unlike the socialist Rada, it was able to establish an effective administrative organization, established diplomatic ties with many countries, and concluded a peace treaty with Soviet Russia. In a few months, the Hetmanate also printed millions of Ukrainian language textbooks, established many Ukrainian schools, two universities, and the Ukrainian Academy of Sciences. The Hetmanate government also supported the confiscation of previously-nationalized peasant lands by wealthy estate owners, often with the help of German troops. This led to unrest, the rise of a peasant partisan (guerrilla) movement, and a series of large-scale popular armed revolts. Negotiations were held to garner support from previous Rada members Petliura and Vynnychenko, but these activists worked to overthrow Skoropadsky. On July 30, a Russian Left Socialist-Revolutionary, Boris Mikhailovich Donskoy, with help from the local USRP succeeded in assassinating von Eichhorn, blowing him up in downtown Kiev at a broadlight. Due to the impending loss of World War I by Germany and Austria-Hungary, Skoropadsky's sponsors, the Hetman formed a new cabinet of Russian Monarchists and committed to federation with a possible future non-Bolshevik Russia. In response, the Ukrainian socialists announced a new revolutionary government, the Directorate, on November 14, 1918. The Government of UNR 1920 - Symon Petlura sitting in the centre. Proposed borders presented by the Ukrainian delegation at the Paris Conference. The Directorate gained massive popularity, and the support of some of Skoropadsky's military units including the Serdiuk Division. Their insurgent army encircled Kiev on November 21. After a three-week-long stalemate Skoropadsky abdicated in favor of the Council of Ministers who surrendered to the Revolutionary forces. On December 19, 1918, the Directorate took control of Kiev. The Bolsheviks invaded Ukraine from Kursk in late December 1918 where the new Ukrainian Soviet government was reestablished earlier in November of the same year. On January 16, 1919 Ukraine officially declared a war on Russia while the Russian Soviet government continued to deny all claims of invasion. On January 22, 1919, the Directorate was officially united with the West Ukrainian People's Republic, although the latter entity de facto maintained its own army and government. In February 1919, the Bolsheviks captured Kiev. Throughout 1919, Ukraine experienced chaos as the armies of the Ukrainian Republic, the Bolsheviks, the Whites, the foreign powers of the Entente, and Poland, as well as anarchist forces such as that of Nestor Makhno tried to prevail. The subsequent Kiev Offensive, staged by the Polish army and allied Ukrainian forces, was unable to change the situation, and in March 1921, the Peace of Riga sealed a shared control of the territory by Poland, the Russian SFSR, and the Ukrainian RSR. As the result, the lands of Galicia (Halychyna) as well as a large part of the Volhynian territory were incorporated into Poland, while the areas to the east and south became part of Soviet Ukraine. After its military and political defeat, the Directorate continued to maintain control over some of its military forces. 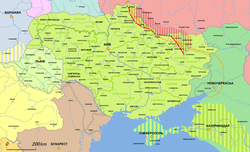 Preempting a planned invasion by its rival Archduke Wilhelm of Austria, in October 1921 the Ukrainian National Republic's government-in-exile launched a series of guerrilla raids into central Ukraine that reached as far east as Kiev Oblast. On November 4, the Directorate's guerrillas captured Korosten and seized much military supplies. But on November 17, 1921, this force was surrounded by Bolshevik cavalry and destroyed. The following is the list of numerous uprisings that took place during the formation of the Ukrainian People's Republic. Some of them were in opposition to the Petlyura's government (such as the Oskilko's Affair), some were against the establishment of the Soviet regime, some took place to eliminate the Entente forces. According to Cheka documentation, in Ukraine took place 268 uprisings from 1917 through 1932, where in over 100 raions the mutinied peasants were killing chekists, communists, and prodotryads that were requisitioning food by force which more resembled expropriation. The Ukrainian People's Republic was recognized de jure in February 1918 by the Central Powers of World War I (Austria-Hungary, Germany, the Ottoman Empire and Bulgaria) and by Bolshevik Russia, the Baltic States (Estonia, Latvia and Lithuania), Georgia, Azerbaijan, Romania, Czechoslovakia, and the Holy See. De facto recognition was granted by Switzerland, Sweden, Denmark, and Persia. Later in 1918 Russia chose to withdraw its recognition of independent Ukraine, representing the protocols of the Versailles Treaty as justification for its action. In 1920 Symon Petliura and Józef Piłsudski signed the Warsaw Treaty in which both countries established their borders along the Zbruch River. According to the latest census that was taken 1897, the republic was accounted for over 20 million population in seven former Russian guberniyas, plus three uyezds of the Taurida Governorate that were located on the mainland. On March 4, 1918 the Ukrainian government accepted the law about the administrative-territorial division of Ukraine. The law stated that Ukraine is divided into 32 zemlia (land) which are administrated by their respective zemstvo. This law was not fully implemented as on April 29, 1918 there was the anti-socialist coup in Kiev, after which Hetman Pavlo Skoropadsky reverted the reform back to the guberniya-type administration. The headquarters of the republic's armed forces was called the General Bulawa and was considered to be located in Kiev. Of course, due to constant intervention from the Petrograd sovnarkom and the German Empire the physical location of it was changing (Kamyanets-Podilsky, Bila Tserkva, others). The following three Zaporizhian infantry regiments and the 3 Haidamaka Regiment of the biggest Ukrainian military formation, the Zaporizhian Corps, later were reorganized into the 1 Zaporizhian Division. There were numerous banks in the republic among the most popular ones were the Ukrainabank and the Soyuzbank that were created by Khrystofor Baranovsky, the leader of a cooperative movement. Green indicates UPR-controlled territory, red indicates the Red Army control, light yellow for the White Army control, dark yellow for Germany, blue for Poland, and brown for Romania. Bold black line incidates the borders of modern Ukraine. This page is based on the Wikipedia article Ukrainian People's Republic; it is used under the Creative Commons Attribution-ShareAlike 3.0 Unported License (CC-BY-SA). You may redistribute it, verbatim or modified, providing that you comply with the terms of the CC-BY-SA.